If you are interested in a career in early childhood education, then you should consider an online bachelor’s in early childhood education degree. Early education professionals have a direct influence on the next generation during the most formative years of their lives. In this rewarding field, professionals watch children grow and inspire them to become good, caring citizens. There’s no shortage of young minds in search of an education, so there will always be a demand for good early education teachers. Upon earning an early childhood education bachelor’s degree online, graduates find jobs as preschool teachers, preschool directors, and private tutors. If you’re interested in working with children and helping them to succeed, consider pursuing an early childhood education degree online. What Degree Do You Need for Early Childhood Education? Online Bachelor’s in Early Childhood Education Degree Program Ranking Guidelines: We selected the below accredited online early childhood education programs based on quality, types of courses offered, faculty, rankings, awards, and reputation, including the school’s reputation for providing quality online degrees. Formerly offered as a bachelor of arts in early childhood and family studies, the bachelor of arts in early care and education at UW offers many advantages to online students pursuing careers in early childhood education. Full-time students can complete the program’s flexible curriculum in two years, while part-time learners can graduate in three years. Students who earn this early childhood education bachelor’s degree online follow the Intentional Teaching Framework model. This framework stresses four steps that lead to content mastery: learning in the classroom, watching concepts through teacher observations, practicing concepts, and reflecting. Students can choose a core pathway or a teaching and leader pathway. The latter option stresses leadership skills. However, neither pathway prepares graduates for K-6 teacher licensure. Applicants need an associate degree or at least 70 transferable credits earned with a minimum 2.5 undergraduate GPA. The program’s application deadline falls on February 15. Faculty use a cohort learning model with new part-time and full-time cohorts beginning each fall. All online students pay the same per-credit tuition regardless of residency. However, Washington state students may qualify for additional scholarship and grant opportunities. Over 3,000 active military personnel, veterans, and their dependents attend UW to access their GI Bill® benefits. Additionally, the university works closely with student members of recognized Native American tribes to find appropriate scholarship opportunities. The online bachelor of science in early childhood education at FIU prepares graduates to work with children ages 0–5 in childcare centers. The program’s specialized curriculum stresses child development, educational psychology, and emotional development. To ensure student success, FIU pairs undergraduates with academic coaches who provide support throughout the program. Students can begin this individually paced program in the fall, spring, or summer terms. The degree’s 30 credits of major-related coursework include classes in classroom management, educational psychology, and issues in early childhood education. Graduating from the program does not confer teacher licensure or certification in any state. However, students who pursue this early childhood education degree online take many courses that should help prepare them to meet licensure requirements. Students with excellent grades can join FIU’s Honors College—an advanced program that includes online seminars and a thesis. The Honors College qualifies students for exclusive scholarships, internships, and an honors diploma. Prospective students may apply as transfer students or freshmen. Freshmen applicants need to submit ACT or SAT scores. Transfer applicants must hold associate degrees or at least 60 transferable credits earned with a minimum 2.5 undergraduate GPA. The school may ask transfer students who earned a degree outside of Florida to take additional core courses to satisfy the state’s college graduation requirements. Unlike some other online programs, in-state students save approximately 33% on tuition compared to out-of-state learners. FIU is regionally accredited by the Southern Association of Colleges and Schools (SACS). At UA, all students in the school’s BS in human environmental sciences, early childhood education program concentrate on early childhood development. This in-depth education prepares graduates to work with children ages 0–8 in daycares and other childcare settings. Although students take courses online, learners living near the Tuscaloosa campus may further their educational experience by volunteering at UA’s Child Development Research Center. The center conducts child development research while providing daycare and educational services to over 100 children. 30 credits of major-related coursework include classes in conceptual experiences for young children, preschool development, and introduction to psychology. All students complete a one-semester internship at a local school or daycare center; students make their own internship arrangements. Most graduates go on to work in preschools. However, the program offers an optional child development practitioner concentration, which is an excellent option for students who plan to work at a Head Start agency after graduation. The program encourages transfer students to apply. It accepts associate degrees or up to 60 transfer credits towards completion of bachelor’s degree requirements. The program also accepts incoming freshmen. All students pay the same credit-based tuition. UA offers eight exclusive scholarship opportunities to students pursuing an early childhood and primary education degree online. UA is regionally accredited by the Southern Association of Colleges and Schools (SACS), and its early childhood education program holds programmatic accreditation from the National Association for the Education of Young Children (NAEYC). The bachelor of science in child, youth, and family studies with an emphasis in early childhood in a mobile society program at UNL stands apart from other early childhood education degrees by preparing graduates to work with young children who move frequently. Graduates can work in education and childcare settings that do not require state licensure or certification. Online courses follow the curriculum prescribed by the National Association for the Education of Young Children. The 13 core classes include guidance and classroom environments, supervision in early childhood education, and working with families. In addition to coursework, students complete three practica. To reach the 120 credits UNL requires for a bachelor’s degree, students can take up to 42 elective credits to pursue a second major, a minor, or study child development topics in greater detail. Freshmen students may apply to UNL but cannot start the program until they complete at least 30 general education credits. Transfer students with at least 30 credits may apply to the program directly. Other transfer requirements include a minimum 2.5 undergraduate GPA. The school provides a convenient course equivalency list for prospective transfer applicants. Additionally, all applicants need to hold a clean criminal record. Distance learners pay the same per-credit tuition for general education courses. However, for major courses, out-of-state students pay double the in-state per-credit rate. The school awards financial aid packages to students with excellent GPAs and standardized test scores. Nebraska students may also qualify for free tuition through Collegebound Nebraska. UNL is regionally accredited by the Higher Learning Commission (HLC). Brandman offers prospective students a BA in early childhood education through fully online and hybrid tracks. In the hybrid program, students take some courses on one of Brandman’s 20 campuses, located throughout California and Washington. The 120 credits Brandman requires for a bachelor’s degree include 51 major-related credits, 42 core credits, and 27 elective credits. The major curriculum includes coursework on teaching in a diverse society, supporting children with exceptional needs, and becoming an intentional and reflective educator. All professors possess extensive early child development experience and advanced degrees. Students interested in earning this early childhood education degree online can attend one of the university’s monthly virtual academic information sessions. The department website also maintains a blog that discusses changes in the educational and professional landscapes for early childhood education graduates. This early childhood education online program only accepts transfer applicants who hold at least 12 undergraduate credits earned with a minimum 2.0 GPA. Before new students begin the program, which they can do at one of six points throughout the year, they can apply to earn transfer credit based on challenge exams or by submitting a portfolio. This program does not lead to licensure but accepts transfer applicants from all states. A private university, Brandman charges the same per-credit tuition to all students. However, California residents may qualify for Cal Grants A or B, which provide financial aid to students with financial need and those with excellent academic records. Brandman is regionally accredited by the Western Association of Schools and Colleges (WASC). Its early childhood education program holds programmatic accreditation from the National Council for Accreditation of Teacher Education (NCATE). Prospective students seeking an early childhood education degree online that emphasizes special education should consider attending BSU. The university’s bachelor’s degree in early childhood education features a special education minor that all students complete. Online courses use weekly due dates to give students increased flexibility. Full-time learners with associate degrees can earn their bachelor’s in two years. The curriculum trains students in five competencies: promoting children’s development, building relationships with families, assessing children’s growth, teaching, and becoming a professional. Students master these competencies by taking 16 major courses, including early emergent literacy, promoting pro-social behavior in young children, and assessment of young children with exceptional needs. The university offers a variety of support to online students, including a virtual library, tutoring, and technology support services. The program encourages prospective students who work full time to apply. Applicants need associate degrees in early childhood education or at least 45 transferable credits earned with a minimum 2.5 GPA. Indiana students save 33% on tuition compared to out-of-state learners and may qualify for T.E.A.C.H. scholarships that cover up to 80% of tuition. Out-of-state students may receive university scholarships or loans based on academic merit or financial need. New students can begin the program in the fall, spring, or summer semester. BSU is regionally accredited by the Higher Learning Commission (HLC). The school’s early childhood education program boasts accreditation from the Council for the Association of Educator Preparation (CAEP). The online bachelor of science in elementary education at MSU offers students two concentration tracks: early childhood and middle school. The program qualifies graduates, aside from Georgia residents, to earn teacher licensure in their home states. Students can continue working full or part time until their senior year when they must complete student teaching experiences at local schools. The school delivers early childhood education degree online courses through the Canvas learning management system. Most classes use a 20-student cap to ensure low student-to-faculty ratios. Online students can select from more than 24 course offerings each semester. Popular classes include math education at the elementary school level, intro to elementary education, and teaching literature at the middle school level. All online classes use a 16-week format that mirrors on-campus courses. Students must earn a minimum C grade in all of their courses. Individuals nearing graduation can take advantage of MSU’s career center to research job opportunities throughout the country. MSU accepts freshmen and transfer applicants. Application requirements include a minimum 2.5 GPA, two recommendation letters, and at least 40 hours of work experience with children. Transfer credits may apply if students left their previous school in good standing. Prospective students can enroll in the spring, summer, or fall terms. In-state and out-of-state online students pay the same credit-based tuition rate. MSU is regionally accredited by the Southern Association of Colleges and Schools (SACS). Its bachelor’s program in elementary education boasts specialized accreditation from the National Council for Accreditation of Teacher Education (NCATE). KSU’s College of Human Ecology offers an early childhood education bachelor’s degree with a unified teaching license (B-K) that fulfills state requirements for an early childhood teaching license. This license qualifies graduates to work as kindergarten teachers in public schools. Out-of-state students who live in National Association of State Directors of Teacher Education and Certification member states may also qualify for a teaching license. Students can apply up to 43 credits from an associate degree towards their bachelor’s requirements. The curriculum features 69 major-related credits, including classes in language development, emergent literacy, and behavioral management. Students can personalize their education through three elective courses. To remain in good academic standing, participants must maintain a minimum 2.75 GPA. Although KSU encourages transfer students to apply, the program also accepts college freshmen. Applicants need a minimum 2.0 GPA, and freshmen applicants must submit SAT or ACT scores. Transfer students can research KSU’s credit transfer policies through the university’s transfer equivalency guide. All online students pay the same credit-based tuition regardless of residency. In addition to tuition, KSU charges a distance education fee for each online credit a student attempts. Learners with financial need and a 3.0 GPA may automatically receive $1,000 in financial assistance. The university works closely with active teachers, military veterans, and women to pair them with targeted scholarship opportunities. KSU is regionally accredited by the Higher Learning Commission (HLC). Its early childhood education program holds accreditation from the National Council for Accreditation of Teacher Education (NCATE). The bachelor of science in early childhood education at Liberty prepares students for childcare careers that do not require licensure or certification. An accelerated program, all courses last eight weeks and full-time students who start as freshmen can graduate in under four years. Graduates automatically qualify for the university’s master’s in teaching program, which conveys licensure. The program’s asynchronous curriculum includes 48 major credits. Curricular highlights include classroom management for teachers, differentiating instruction, and a field experience capstone that students can complete locally. Participants receive electronic textbooks at no additional cost. Although a religious institution, Liberty does not require early childhood education online students to take faith-based courses. New students can begin at one of six points throughout the year. Applicants need a minimum 2.0 undergraduate GPA. A private university, Liberty charges all online students the same tuition. New transfer students may apply up to 90 credits towards their bachelor’s degree but must complete at least 50% of their major courses at Liberty. Active military personnel and veterans receive an automatic 66% discount on tuition. Students who work as first responders also receive automatic tuition assistance. Liberty waives its application fee for current and former service members. Liberty is regionally accredited by the Southern Association of Colleges and Schools (SACS). Its early childhood education program holds accreditation from the National Council for Accreditation of Teacher Education (NCATE). The bachelor of arts in early childhood development at FPU prepares graduates to work with children ages 0–8 in childcare environments that do not require teacher certification or licensure. However, the program does follow California and National Council for Accreditation of Teacher Education guidelines for teacher preparation programs. Many graduates continue their education at FPU to earn California teacher licensure. Using the program’s hybrid, cohort-based learning model, students pursuing an early childhood education degree online meet once per week on the school’s Fresno, Merced, or Visalia campus. The university caps cohorts at 24 students. In this accelerated program, each synchronous course lasts six weeks. The program features courses on human diversity, children’s play and learning theory, and math and science for young children. Although students cannot select a concentration, the program’s focus on special education makes it ideal for learners who plan to work with children with special needs. Cohorts graduate in 18 months. A Mennonite university, FPU requires early childhood education students to take two religion courses. Current FPU students or transfer students can apply to the program after completing 60 college-level credits earned with a minimum 2.4 GPA. Transfer students need an associate degree in early childhood education, psychology, or sociology. The school waives the application fee for applicants who attend an on-campus information meeting. All distance learners pay the same per-credit tuition rate, and online students qualify for university scholarships. New students create a scholarship account and apply to relevant opportunities. FPU is regionally accredited by the Western Association of Schools and Colleges (WASC). FPU’s School of Education possesses accreditation from the California Commission on Teacher Credentialing (CTC). The birth-kindergarten program at WCU awards a BS and features three concentration tracks in early childhood, professional education, and alternative licensure. Students who select the early childhood concentration do not earn teacher licensure in North Carolina, and students who select the alternative licensure concentration need a bachelor’s to apply. The 10-course, synchronous core curriculum includes literacy, child development, and early childhood curriculum courses. In the professional education and alternative licensure concentrations, the university places students in North Carolina pre-K or kindergarten classrooms for student teaching. For this reason, out-of-state students cannot complete these two concentrations. Students who concentrate in early childhood, however, can complete action research at local childcare centers. Distance learners pursuing an early childhood education degree online take courses through the Blackboard learning management system. Students communicate with professors and peers through chat rooms, drop boxes, and discussion boards. Applicants to the early childhood track need an associate degree earned with a minimum 2.75 GPA and can enroll in the spring or fall. Some students who earned associate degrees outside of North Carolina may need to retake specific courses, especially if they plan to pursue licensure. The school does not award transfer credit for work portfolios or challenge exams. WCU boasts one of the lowest tuition rates on this ranking, and military personnel and veterans benefit from an automatic tuition reduction. WCU is regionally accredited by the Southern Association of Colleges and Schools (SACS). The fully online BS in early childhood education (nonlicensure) at Regent uses eight-week courses to help students move through coursework quickly. Based on a combination of education courses and Christian principles, the university prepares graduates to help children develop academically, socially, and spiritually. Graduates who earn an early childhood education degree online can pursue careers as preschool teachers, education consultants, and parent educators. Incoming students with an associate degree can earn a bachelor’s in two years. Regent’s suggested four-year course sequence includes 15–16 credits of asynchronous classes each term. Major requirements include classes in guiding young children, physical wellness, and childcare program administration. General education requirements feature five courses on the Bible, Christian doctrine, and religious history; incoming freshmen complete these courses in their first year. The program concludes with a practicum that students complete locally. Incoming students can start the program at one of six points throughout the year. This early childhood education program accepts freshmen and transfer applicants with associate degrees in early childhood education. Incoming students can earn credit based on challenge exams, military experience, and Advanced Placement exams. Applicants must also pass a criminal background check. Unlike some of the other colleges and universities on this ranking, Regent charges a discounted per-credit tuition rate to full-time online students; distance learners pay significantly less than their on-campus peers. Active military personnel and veterans may qualify for free tuition through the university’s Troops to Teachers program. Regent is regionally accredited by the Southern Association of Colleges and Schools (SACS). The online early childhood education (birth-age 5) program at UC boasts specialized associate and certificate options in addition to a bachelor’s track. Students take courses entirely online. Incoming freshmen typically earn a bachelor’s degree in four years of full-time study, while transfer students can finish in two years. Graduates go on to work in preschools, childcare centers, and Head Start programs. The core curriculum features coursework on classroom organization and guidance, creative arts in early care and education, and preschool student teaching. The university works with online students to help learners find appropriate student teaching placements. The early childhood education curriculum boasts three optional concentrations: pre-K, administration, and infant-toddler. Students who select a concentration take nine additional credits. Participants must maintain a minimum 2.8 GPA and earn a C or better in all courses to remain in good academic standing. Transfer applicants interested in earning this early childhood education degree online must possess a minimum 2.5 undergraduate GPA. Additionally, transfer students must complete at least 30 credits at UC to earn a bachelor’s. Prospective students can enroll in the spring or summer semester. Full-time, out-of-state distance learners pay slightly higher tuition than in-state students. New students who qualify for a TEACH Grant receive up to $4,000 in aid each year that they study full time. UC is regionally accredited by the Higher Learning Commission (HLC). Its early childhood education program holds accreditation from the Council for the Association of Educator Preparation (CAEP), the National Council for Accreditation of Teacher Education (NCATE), and the Ohio Department of Education. The completely online child development and family studies BS at WVU offers students a flexible, asynchronous degree track. Full-time transfer students who take courses during the university’s flexible summer term can graduate in 18 months. Graduates prepare to work as child social workers and preschool directors. This early childhood education program offers two tracks. The birth-4 track confers West Virginia pre-K certification, making it an excellent option for in-state students who plan to work in public schools. The school also helps in-state students who have young families locate affordable childcare during the program’s student teaching component. Alternatively, the nonlicensure child development track includes coursework on families across the life span, infant development, and a child development practicum. All courses use electronic textbooks. Students must earn a C- or better in all courses to stay in good academic standing. Freshmen and transfer applicants need a minimum 2.5 GPA. Before starting the program, students work one-on-one with enrollment coaches and academic advisers to create a personalized graduation plan. All students pay the same per-credit tuition rate regardless of residency. Each year, WVU awards multiple need-based and merit-based scholarships to in-state and out-of-state students. WVU is regionally accredited by the Higher Learning Commission (HLC). The school’s early childhood education bachelor’s program boasts accreditation from the National Council for Accreditation of Teacher Education (NCATE). CMU’s Global Campus boasts over a dozen completely online bachelor’s degrees, including a bachelor of science in early childhood development and learning. Although the program does not confer licensure, it closely follows many requirements set forth by the Michigan Department of Education for teacher preparation. The program’s 43 credits of major-related curriculum follows guidelines established by the National Association for the Education of Young Children. Students take courses on infant-toddler development, guidance for young children, and best practices in early childhood settings. Participants also complete a practicum and a capstone that includes supervised teaching experience. Although CMU offers this program asynchronously, it offers a suggested course schedule to help keep students on track for graduation. Learners must maintain a minimum 2.7 GPA to stay in good academic standing. Freshmen applicants need a 2.0 high school GPA or higher. All distance learners pay the same per-credit tuition rate. However, federal employees, Michigan state employees, and active military personnel receive automatic tuition discounts. Active military personnel save over 40% on their degrees compared to the average online student. The school accepts scholarship applications from incoming freshmen and transfer students between the fifth of February and the fifth of April. Michigan residents who already work in a childcare setting may receive tuition assistance through T.E.A.C.H. Early Childhood® Michigan. This scholarship provides significant support to students who earn less than $17 per hour at their current childcare jobs. CMU is regionally accredited by the Higher Learning Commission (HLC). Its early childhood education program holds accreditation from the Council for the Association of Educator Preparation (CAEP). Ideal for working professionals and parents, the flexible BA in early childhood education program at MVNU allows students to balance studying with other responsibilities. In-state students and those planning to relocate to Ohio receive an early childhood education generalist endorsement. This endorsement qualifies graduates to teach pre-K–5 in public schools. 51 credits of major-related coursework includes classes in content reading, unit planning, and developmental literacy. The program also features 600 hours of field experiences, practica, and clinicals in diverse educational settings. All courses use online textbooks. Transfer students who need general education credits can earn these through the university’s general studies program. Although a Christian university, MVNU does not require early childhood education students to take courses on the Bible or Christian teachings. Before applying, prospective students can attend an on-campus information session or webinar. Freshmen applicants must submit standardized test scores. Transfer applicants need a minimum 2.7 undergraduate GPA to transfer credits. The school also awards college credit based on prior experience and challenge exam results. All applicants must interview with a faculty adviser, but the school does not charge an application fee. Incoming students benefit from locked-in tuition; they pay the same tuition rate for their entire time in school. MVNU is also a member of the Yellow Ribbon Program. MVNU is regionally accredited by the Higher Learning Commission (HLC). Its early childhood education program holds accreditation from the Ohio Board of Regents. The bachelor of science in early childhood unified program at FHSU boasts a unique curriculum that prepares students for teaching and administrative roles. The program also satisfies Kansas requirements for K-3 teacher licensure. Although participants can take all courses online, local students can complete some courses on campus. The school accepts individuals interested in earning an early childhood education degree online in the fall and spring semesters. This bachelor’s degree requires 126 credits, 55 of which relate to the major. Students start major coursework after completing general education courses. Classes include early childhood education mathematics methods, assessment in special education, and educational psychology. The curriculum also features multiple field experiences that culminate in a semester-long student teaching experience. Although participants must complete their student teaching requirement last, faculty deliver coursework in a mostly asynchronous format. Freshmen applicants must submit ACT or CORE scores, and transfer applicants need an associate degree or at least 45 transferable credits. All students pay the same per-credit tuition rate. Kansas residents who maintain a minimum 2.75 GPA receive the InPLACE Scholarship, which awards $1,000 each semester as long as recipients remain in good academic standing. The school also boasts a Kappa Delta Pi chapter and four additional education organizations that online students can join. Students enrolled in UNK’s bachelor of arts in education, early childhood inclusive program learn how to work with young children with special needs as well as in general education classrooms. Each course requires about 9–12 hours of study per week. The university publishes its online course offerings two semesters in advance so students can plan their course loads and graduate on time. The program includes a 24-credit professional sequence and 50 credits of major-related coursework. Students complete five field experiences and classes covering early childhood program administration, primary grades literacy, and assessment and intervention. Field experiences allow students to apply their knowledge in practical settings. Near the program’s end, students select one of two specializations: birth through kindergarten or age three to grade 3. In some courses, online students must use a local proctoring center to take exams. In-state students save approximately 33% on tuition compared to out-of-state students. All distance learners pay a technology and distance education fee for each credit they attempt. New students can begin the program in the spring, summer, or fall semester. UNK is regionally accredited by the Higher Learning Commission (HLC). The school’s early childhood education program boasts accreditation from the Nebraska Department of Education and the Council for the Association of Educator Preparation (CAEP). IWU’S bachelor of science with a major in early childhood education features a minor in reading education. Incoming students with an associate degree in early childhood education can earn their bachelor’s in two years. The program qualifies graduates for an initial Indiana pre-K–3 teaching license. Faculty deliver the major’s 51 credits of synchronous coursework through a cohort learning model. Students complete five pre-professional courses before moving on to core professional courses. Core professional courses include literacy in the primary grades, STEM concepts, and the literature-focused preschool environment. The program concludes with an internship and student teaching, which lasts 14 weeks. Courses use a mix of physical and digital textbooks. Students must maintain a minimum C average to stay in good academic standing. Participants who fail a course must pause their education for one term and retake the course with a new cohort. The school accepts high school graduates, transfer students, and GED holders. The most competitive applicants earn at least a 24 or 1,170 on the ACT or SAT, respectively. Students pay a standard per-credit tuition rate regardless of residency. Early childhood education students who belong to a minority group can apply for a William A. Crawford Minority Teacher Scholarship. Active military personnel receive an automatic 66% tuition discount in addition to all other GI Bill® benefits. This program accepts a new cohorts each month. IWU is regionally accredited by the Higher Learning Commission (HLC). The online early childhood education program holds accreditation from the Council for the Association of Educator Preparation (CAEP). The BA in early childhood at VUSC targets students who want to educate young children and promote their spiritual development. An accelerated program where all courses last seven weeks, students with an associate in early childhood education can graduate in 18 months. The 124-credit curriculum includes three components: general education, major coursework, and electives. The major features in-depth classes related to special education, such as teaching students with special needs in the general education classroom, principles of applied behavior analysis in autistic children, and assessing exceptional learners' growth. Near the program’s conclusion, students complete two advanced practica and a research-based capstone course. A Christian university, VUSC requires students pursuing an early childhood education degree online to complete faith-based coursework. New students can start the program in the fall or spring. The school accepts transfer students, high school graduates, and GED holders. Incoming freshmen benefit from a four-year graduation guarantee. If a student cannot graduate in four years, through no fault of their own, the university does not charge additional tuition for additional courses. Unlike some of the other schools on this ranking, VUSC charges full-time online students a flat tuition rate, no matter how many credits they attempt. A private institution, the university charges the same tuition to all distance learners. Nearly all eligible students receive some form of need-based aid. In 2019, VUSC launched an honors program that awards students $2,000 per year. The honors program requires additional coursework and community service. VUSC is regionally accredited by the Western Association of Schools and Colleges (WASC). An anchor of the North Dakota University System, MSU ranks among the nation’s best early childhood education degrees online, according to U.S. News & World Report . MSU also offers highly regarded programs in mathematics, mathematics education, and special education. 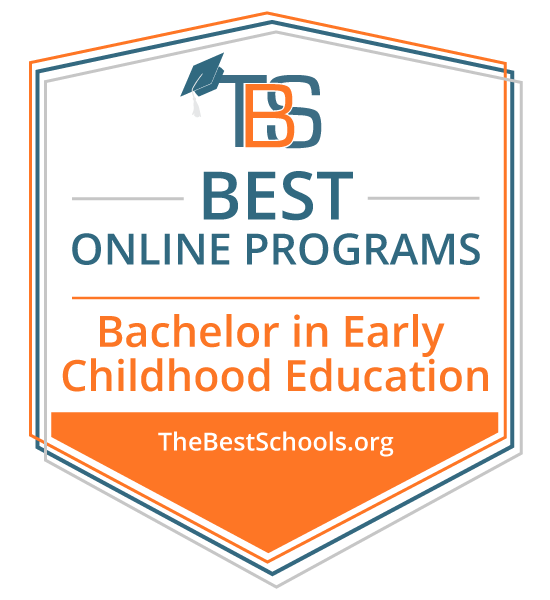 MSU’s early childhood education bachelor’s degree (B.S.Ed.) online encompasses 132 credits. The curriculum combines core professional and professional education courses, culminating in an in-school practicum experience. Graduates qualify to pursue licensure in early childhood education and work as teachers in North Dakota for children from birth to age 8, or from preschool through third grade. Early childhood education majors must complete 36 credit hours in essential studies and can pursue an optional minor. Distance learning at MSU combines online learning with field-based coursework in a local school or educational institution. Learners enjoy small class sizes and flexible credit transfer options. MSU accepts transfer credits from any regionally accredited institution and transfer credits don’t expire. Graduates with a BA in early childhood education or a B.S.Ed. in elementary education can easily transfer credits toward this online program at MSU. MSU remains in the process of transitioning its online learning platform from Moodle to Blackboard Learn. The degree consists primarily of synchronous and evening courses, delivered through Interactive Video Network. Distance learners enjoy a flat, per-credit tuition rate for online courses. MSU assigns each online student their own personal academic adviser for the duration of their studies at the university. MSU is regionally accredited by the Higher Learning Commission (HLC).The online B.S.Ed. program is fully accredited by the Council for the Accreditation of Educator Preparation (CAEP). Located in historic Winston-Salem, North Carolina, WSSU remains among the nation’s most celebrated historically black colleges and universities (HBCUs). The Wall Street Journal ranked WSSU among the top HBCUs in the United States. The school also ranked No. one in North Carolina and No. 22 nationally for graduating black students in the field of education, as reported by Diverse Issues in Higher Education in 2017. The early childhood education degree online at WSSU offers a choice of three concentrations: birth-kindergarten education teacher licensure, birth-kindergarten business optional, or early intervention and preschool. Students pursuing licensure through the early childhood education degree online can participate in WSSU’s educator preparation program, through the office of field and clinical experiences. The program prepares graduates to teach children from birth to age 5.Candidates for the early childhood and primary education degree online must complete 120–126 credit hours in general education, foundation, breadth, and depth courses. The teacher licensure program requires a practicum, a seminar, and student-teaching coursework, while the business optional and early intervention tracks require internships in early childhood education. Core topics in all concentrations include classroom management, early language and literacy, and child development. WSSU delivers distance coursework through Blackboard. Students complete courses online and participate in regular video discussions with their peers and professors. WSSU offers a special set tuition rate for students designated as distance learners. WSSU is regionally accredited by the Southern Association of Colleges and Schools (SACS). The online bachelor’s is fully accredited by the National Council for Accreditation of Teacher Education (NCATE). A Baptist institution based in Riverside, CBU offers more than 40 online programs, including an early childhood education bachelor’s degree online. U.S. News & World Report ranks CBU programs among the best online bachelor’s degrees and best online bachelor’s programs for veterans in the nation. The early childhood education (ECE) degree online at CBU trains educators to teach students from birth to age 8. Students enrolled in the online bachelor of arts in early childhood studies may choose to concentrate their studies in either K–12 teaching or ECE specialist credential. The program prepares graduates to teach in diverse learning environments, engaging both disabled and non-disabled students. Earning CBU’s early childhood and primary education degree online requires 48 major units. The program requires prerequisites in composition and includes coursework in cognitive development, early childhood intervention, and STEM integration. Students must complete an early childhood research seminar at the end of the program. CBU distance learners complete coursework in the Blackboard platform, with support from innovative online learning technologies, including Movi-Cisco, WebEx, and Voice Thread. Students can complete the early childhood education bachelor’s degree online within 16 months. CBU Online offers competitive tuition rates, including financing options and low loan default rates. Distance learners also enjoy exclusive career transition and placement services. California Baptist University is regionally accredited by the Western Association of Schools and Colleges (WASC). Set against 67 acres of lush woods in Saint Mary-of-the-Woods, Indiana, SMWC operates a rural campus just five miles northwest of Terre Haute. The college boasts more than 40 years of experience developing distance learning programs, including an early childhood education (ECE) degree online. The online ECE bachelor’s degree at SMWC offers students the opportunity to earn dual licensure in preschool through grade three and early childhood special education. Students must complete clinical or field experience during the last semester of their degree, arranged in an Indiana- or Illinois-based public or private school. SMWC emphasizes small class sizes in both traditional and online courses, with a student-to-faculty ratio of just 13-to-1. Students may complete the ECE bachelor’s degree at SMWC through online or face-to-face coursework. Additionally, the online childhood education degree offers some courses in a hybrid format. Following the traditional course schedule, students may complete each online ECE course in 16 weeks, though the program also offers an accelerated option that uses eight-week courses. Online learners at SMWC can apply for exclusive scholarships and financial aid to help fund their degrees. The ECE degree online offers year-round start dates. SMWC students enjoy exclusive online tutoring and mentoring services, career support, and access to the same campus-based learning resources as on-campus students. SMWC is regionally accredited by the Higher Learning Commission (HLC). Founded in Gainesville, Georgia in 1878, Brenau helped set the gold standard for higher education in the state. The university adopted its name from the German term for to burn, combined with the atomic symbol for gold, which explains the school’s motto: as gold refined by fire. An innovator in distance education since launching its first online program in 1998, Brenau today offers roughly 40 degrees and certificates online. Students complete courses through Blackboard. Online coursework follows a condensed, accelerated schedule. Distance learners enjoy small class sizes of 20 students or fewer, providing them with personalized attention from instructors. Brenau’s early childhood education (ECE) bachelor’s degree online prepares prospective educators to teach children from birth through age five in the state of Georgia. Students must complete 120 credits, including coursework in child development and professional skill-building, and emphasizing field experience through practicum courses. All Brenau programs stress a comprehensive liberal arts curriculum in four subject areas: world understanding, scientific and analytic curiosity, artistic and creative imagination, and communication and language fluency. All online learners at Brenau qualify as full-time students—regardless of their course load -- enabling them to apply for state and federal financial aid. Students enrolled in the ECE degree online can also seek advice from personal financial aid counselors. More than 30% of students enrolled at Brenau pursue distance learning opportunities there. Brenau is regionally accredited by the Southern Association of Colleges and Schools (SACS). The bachelor’s in ECE is fully accredited by the National Council for Accreditation of Teacher Education (NCATE). Awarding its first degrees in 1925, EKU sits on a scenic campus in Richmond, Virginia nearly equidistant to Cincinnati, Ohio and Louisville and Lexington in Kentucky. The university boasts deep roots in the heart of bluegrass country. EKU features more than 40 online programs, including an early childhood education degree. EKU offers a Bachelor of Science Degree in Child and Family Studies with a child development concentration. Students may choose to add a minor or a certificate in early childhood director or infant-toddler care and education. Courses in EKU’s online program last eight weeks each. Coursework follows National Association for the Education of Young Children professional preparation standards, and it covers topics such as foundations of the early childhood professional, guidance and interaction, and early childhood observations and assessment. The program requires 120–125 hours, and it combines online coursework with two practicum experiences. This program’s credit hours count toward the Child Development Associate (CDA) and can potentially be applied toward a student’s state credentials. Students complete courses asynchronously through Blackboard. Distance learners may enroll in two courses per session to qualify as full-time students and pursue financial aid. EKU offers six start dates throughout the year for online programs. Students enjoy online tutoring services and digitized library resources. EKU charges a set tuition rate for online courses, based on the number of credits required for each degree type, regardless of a student’s state of residence. EKU is regionally accredited by the Southern Association of Colleges and Schools (SACS). Founded more than 120 years ago, NAU features a main campus in Flagstaff, additional locations throughout Arizona, and a robust online department. Students can choose from more than 80 online programs across nine colleges, including NAU’s College of Education, which enrolls roughly 3,000 students each year. The early childhood education degree online at NAU comprises 120 units of major, liberal arts, and university coursework requirements. Courses emphasize early childhood development, integrated literacy and language arts, play education, and curriculum and assessment for elementary students. University-specific requirements include junior-level writing coursework and a capstone experience. The College of Education at NAU keeps class sizes small, boasting a student-to-faculty ratio of 17-to-1. Coursework does not require campus visits, but may require a student-teaching experience or practicum outside of the virtual classroom. Students must complete an independent study project as part of their capstone course requirement. NAU honors up to 64 transfer units from students holding an associate degree, or up to 75 transfer units from Arizona community college graduates. NAU online students complete courses using the Blackboard platform. Distance learners may choose between traditional and competency-based online learning, the former offering a combination of synchronous and asynchronous learning, and the latter providing a primarily self-guided program for experienced students. NAU’s online learning environment features around-the-clock tech support, virtual tutoring services, and online resources for distance learners. NAU is regionally accredited by the Higher Learning Commission (HLC). The bachelor of science in child and family studies is fully accredited by the Council for the Accreditation of Educator Preparation (CAEP). Offering holistic academic programs with a global focus, Chaminade is located in the city of Honolulu, on the island of Oahu. The school remains Hawaii’s only Catholic university, and one of only three Marianist universities in the United States. Students can choose from more than 25 academic programs in fields including the fine arts and humanities, nursing, and education. The online bachelor of science in early childhood education (ECE) at Chaminade requires 120 credits in general education, electives, and pre-major and major coursework. Topics include educational technology, curriculum foundations, and health and family issues in ECE. Coursework also emphasizes developmentally appropriate practice through a two-part major requirement. Early childhood education degree online courses culminate in a two-part seminar and double field experiences. Chaminade’s online BS in ECE follows National Association for the Education of Young Children standards for state licensure, preparing graduates to teach children age 2.5 through six in Hawaii. The university also offers online bachelor’s programs in ECE with a Montessori credential, and elementary and secondary education. Chaminade continues to develop innovative education programs through its School of Education and Behavioral Sciences and the Montessori Laboratory School. Students enrolled in online programs at Chaminade complete coursework in Canvas. Distance learners may seek advice from one of several dedicated admissions advisers, skilled in providing assistance specific to online and military applicants. Chaminade offers set tuition rates per credit hour for online learners, regardless of their state of residence, with additional discounts for active and inactive military students. Chaminade is regionally accredited by the Western Association of Schools and Colleges (WASC). The BS in early childhood education is fully accredited by the Council for the Accreditation of Educator Preparation (CAEP). Among the first teacher-training institutions in Alabama chartered exclusively for women’s education, UWA granted its first diplomas in 1886. Today, the university offers more than 50 degrees and certificates online in business, psychology and counseling, and teaching disciplines. Among its most unique features, UWA boasts fully customizable learning options and one of the most affordable tuition rates in the state. The early childhood education degree online at UWA includes 123 credit hours in general education basic requirements, early childhood education (ECE) development, and elective courses. The program does not lead to licensure for teachers in Alabama. Students explore topics such as literature for young children, the importance of play, and behavior management in the classroom. As the program does not require student-teaching experience to meet licensure requirements, students can complete all coursework online without a practicum component. In addition to introducing students to comprehensive ECE concepts, the online bachelor of science in early childhood development emphasizes UWA’s basic skills curriculum in written composition, the humanities, natural sciences and math, and behavioral science. The online bachelor’s degree in ECE prepares graduates for careers as directors, administrators, and educators in early childcare settings. Students completing online courses at UWA can access assignments and communicate with instructors through the Blackboard platform. Distance learners enjoy a variety of online resources, including a help desk for technical support, academic advisers, and self-service advising tools. UWA offers set, per-credit hour tuition rates for all online undergraduate students. The school upholds a generous credit transfer policy that allows students of two- and four-year colleges to transfer up to 60 or 90 credits, respectively, toward their online bachelor’s degrees. UWA is regionally accredited by the Southern Association of Colleges and Schools (SACS). The BS in early childhood development is fully accredited by the Council for the Accreditation of Educator Preparation (CAEP). Founded in Portland, Oregon in 1905, Concordia is a Christian institution that delivers academic programs with an emphasis on service learning. Through its celebrated College of Education, Concordia offers teacher training programs and specialist degrees at all levels, graduating more than 10,000 students throughout the university’s long history. Concordia students may choose to complete the early childhood education degree online or through hybrid course delivery. Concordia’s bachelor of science in early childhood education (ECE) comprises 109 credit hours, spanning general education and upper- and lower-division ECE requirements. Course topics include innovative and creative approaches to learning, character and ethics of the ECE leader, and integrated strategies for teaching. Students must complete a two-part internship to earn the degree. The early childhood education bachelor’s degree online prepares graduates to pursue teacher licensure in Oregon. Applicants may need to satisfy prerequisites in math and science to qualify for admission to Concordia. The curriculum in the online bachelor’s in early childhood development follows the standards set by the National Association for the Education of Young Children. The program stresses the intersection of ECE theory and practice, preparing graduates for careers in educational leadership. Experienced faculty, many with primary- and preschool-specific teaching careers, lead most online ECE courses. Concordia students in online degrees complete courses through Blackboard. Distance courses last for eight weeks, supported by interactive discussion boards, virtual advising options, and live chat sessions. Students can complete most courses asynchronously online. Concordia offers online students up to six start dates throughout the year. Concordia is regionally accredited by the Northwest Commission on Colleges and Universities (NWCCU). Founded in 1910, Southern Miss represents a storied history of Mississippi traditions in higher learning. Southern Miss boasts R1 Carnegie classification, making it one of only 130 universities in the U.S. to hold this distinction. Southern Miss also hosts four Truman scholars, 21 Goldwater scholars, and 35 National Science Foundation graduate fellows. The school’s enrollment totals roughly 15,000, with students from 71 countries, 50 states, and every county in Mississippi. Among the dozens of online undergraduate, graduate, and certificate programs offered through Southern Miss, students may pursue an early childhood education bachelor’s degree online. The bachelor of science in child and family studies features an emphasis in child development, encompassing 124 credits in developmental observations and family systems. Students must complete a combination of general education and major area coursework, culminating in a practicum and capstone project. The curriculum in the online BS in child and family studies prepares students to pursue licensure to teach pre-K and kindergarten students, and for employment in education and human services. Southern Miss charges a flat per-credit tuition rate, based on whether a student claims full- or part-time status—regardless of the student’s state of residence. Distance students may apply for the same scholarships and financial aid as their on-campus counterparts. Southern Miss students complete online coursework through the Canvas platform. Distance learners may customize their schedules with regular full-term, half-term, or intersession classes, each entailing their own completion times and participation requirements. Support for online programs includes technical assistance, a writing center, library resources, and a center dedicated to disability accommodations. Southern Miss is regionally accredited by the Southern Association of Colleges and Schools (SACS). The BS in child and family studies is fully accredited by the Council for Accreditation of the American Association of Family and Consumer Sciences (AAFCS). Founded in 1914 as Denver Bible Institute, CCU remains the flagship Christian university in Colorado since its founding in 1914. The school serves more than 8,000 students across its main campus in Lakewood, six additional learning centers throughout the Rocky Mountain region, and online. CCU offers more than 100 undergraduate and graduate programs, in both traditional and accelerated online formats. CCU’s early childhood education (ECE) bachelor’s degree online prepares graduates to pursue a teaching license in Colorado. The 120-credit program encompasses general education, ECE, liberal arts, and professional core coursework, training aspiring educators to lead pre-K through third grade classrooms. Students must complete an integrative studies seminar, a two-part webinar exploring field-tested teaching methods, and a student-teaching experience to conclude the degree. Additionally, the program requires a biblical studies component. CCU also offers related online programs for aspiring educators of elementary and special education students. Distance learners enjoy a set per-credit tuition rate for adult undergraduate programs, regardless of their state of residence. Military students may qualify for additional discounts if on active duty and/or studying on a military base. CCU guarantees a locked-in tuition rate for six years for both full-time and part-time students, as long as they take at least one course per term. CCU students complete online coursework through Blackboard. The university maintains a generous credit transfer policy, allowing students to apply up to 90 prior learning credits toward a bachelor’s degree at an accredited school. Students may transfer up to 75 credits toward a bachelor’s degree for qualifying life experience. Online courses at CCU follow a year-round semester schedule, with multiple start dates throughout the year. CCU is regionally accredited by the Higher Learning Commission (HLC). Founded in 1872, UT belongs to a network of 14 schools that make up Ohio’s state university system. Through a merger with the Medical University of Ohio in 2006, UT claims half of the third-largest operating budget for a public university in Ohio. The school boasts an enrollment of more than 20,000 students, spanning a main campus in Toledo, a health sciences campus and medical center, and an online division. Students may choose from over 300 academic programs at all levels of study. UT’s early childhood education bachelor’s degree online suits students looking to pursue administrative or supportive positions in preschools or childcare settings. The degree does not lead to licensure for early childhood education (ECE) educators. The program comprises four 16-hour semesters, combining online and field coursework, and acts as a degree-completion program for students with an accredited associate degree. In addition to holding an associate degree with a minimum 2.5 GPA, applicants must also hold at least part-time employment in ECE or childcare. UT’s early childhood education courses follow a fast-track schedule. While students must reside in Ohio to qualify for a set per-credit tuition rate for its online programs, UT offers a specific scholarship for out-of-state distance learners. Students may also apply for a transfer scholarship for online coursework. UT features a generous credit-transfer policy, automatically applying credit for courses taken at local community colleges. UT students complete online coursework through Blackboard. In some cases, distance learners can choose between fully online and hybrid courses. Students enrolled in the online bachelor’s in early childhood education at UT enjoy support services including a help desk, eLibrary, and virtual tutoring options. UT assigns a personal success coach and academic adviser to all online students. UT is regionally accredited by the Higher Learning Commission (HLC). A liberal arts institution established in 1906, CU is a Christian institution that offers academic and technical training programs. The university occupies a main campus in Campbellsville, Kentucky, along with off-campus centers and instructional sites throughout the state and in Costa Mesa, California. The school boasts more than 50 online programs, including certificates and endorsements, as well as associate, bachelor’s, and master’s degrees. CU’s extensive online offerings include an early childhood education degree. Students may choose to pursue teacher certification through the early childhood education (ECE) bachelor’s degree at CU. Both the teacher-certification and non-certification ECE tracks require a clinical practice component, and feature a combination of foundation, pedagogy, and elective courses. The interdisciplinary curriculum explores topics such as child development, interactive and assistive technologies, and advanced assessment in ECE. CU also offers optional ECE concentrations in Montessori studies. Like all degrees offered by the School of Education at CU, the bachelor of science in ECE incorporates Christian service and leadership into its core curriculum. Depending on whether students choose the path toward teacher certification in Kentucky or the non-licensure program, graduates may qualify for positions as preschool, kindergarten, or elementary school teachers; education researchers; or childcare center directors. CU ranks among U.S. News & World Report ’s top 10 in Kentucky for best online graduate education programs and best online bachelor’s programs. The university maintains a set per-credit tuition rate for students enrolled in the online bachelor’s in ECE. Distance learners follow the same academic schedule as their on-campus counterparts, and enjoy six start dates per year in the spring, summer, and fall semesters. CU is regionally accredited by the Southern Association of Colleges and Schools (SACS). The bachelor’s in ECE is fully accredited by the National Council for Accreditation for Teacher Education (NCATE). Founded in 1965 as Florida Junior College, FSCJ today occupies five campuses across Duval and Nassau counties in Florida. The college enrolls over 50,000 students and offers more than 150 academic programs on-campus and online. Students hail from more than 150 countries, with FSCJ’s diverse programs supporting a unique student population, ranging in age from 12 to 106. FSCJ features an early childhood education (ECE) bachelor’s degree online that leads to licensure for Florida teachers in pre-K through third grade classrooms. The 120-credit program encompasses general education, professional core, major concentration, and upper- and lower-division courses. Students must complete a field experience capstone course, which counts toward the 150 required student-teaching hours to earn teacher certification. Applicants to the BS in ECE degree must complete a prerequisite introduction to education course. The program emphasizes curriculum in language and literacy, diversity for teachers, and child growth and development. FSCJ offers in-state tuition rates for online students, who can pursue the same financial aid opportunities as on-campus students. Applicants must hold an associate degree in early childhood management with at least a 2.5 GPA and complete at least one teacher preparation program course in Florida. FSCJ students complete online coursework through Blackboard. Students can enroll in online programs year-round, and complete courses during the fall, spring, and summer terms. Students may access support services for online learners including academic advising, disability services, and career development. Online students may participate in commencement exercises at the FSCJ campus in Jacksonville. FSCJ is regionally accredited by the Southern Association of Colleges and Schools (SACS). Established in 1961 as a branch of WVU, the Parkersburg location debuted as one of the state’s premier community colleges. Today, WVU Parkersburg operates as an independent institution, though it is still affiliated with WVU through a guaranteed admission agreement; graduates of WVU Parkersburg’s two-year programs can seamlessly enter a four-year degree at WVU. Prospective educators can earn an early childhood education bachelor’s degree online. WVU Parkersburg offers a highly flexible and accommodating online bachelor’s in child development. Students can tailor the degree to suit their needs and experience, completing it as part of a certificate, a bachelor’s degree, or a 2+2 degree, designed for associate degree graduates to earn a bachelor’s in an accelerated two-year program. Online students who have already completed their associates degree pay in-state tuition prices for bachelor’s degree level courses. Additionally, WVU Parkersburg caps tuition at 12 credit hours per semester, with no additional charges for extra coursework. The 120-credit program combines online coursework and clinical and/or field experience. Topics explore child development, theories of personality, and fundamentals of speech. WVU Parkersburg designed its bachelor’s in child development to include coursework approved by the West Virginia Department of Education for publicly funded programs, such as Head Start. Applicants may qualify for financial aid, and/or scholarships through West Virginia’s STARS initiative. WVU Parkersburg students complete courses online through the Blackboard platform. Distance learners enjoy the same academic resources as their on-campus counterparts, including advising, career services, and technical support. Depending on availability, online students may enroll in full- or half-term courses in the fall or spring semester. Additionally, some courses may offer online enrollment according to an express, or accelerated, schedule. WVU Parkersburg is regionally accredited by the Higher Learning Commission (HLC). The bachelor’s in child development is fully accredited by the National Council for Accreditation of Teacher Education (NCATE). Originally offering charter courses to fewer than 200 students, WilmU now enrolls more than 20,000 learners each year. The university encompasses a main campus in New Castle, Delaware, plus additional learning centers across Delaware and New Jersey. WilmU features a variety of undergraduate and graduate degrees, spanning seven academic colleges, including hybrid and online delivery options. In fact, 44% of WilmU students in the 2016–2017 school year attended online classes. WilmU students can complete the early childhood education degree online, with the exception of an early care education internship requirement. The 122-credit bachelor of science in education studies includes an emphasis in early childhood education, but does not lead to licensure in Delaware. Students may also pursue related programs in preschool, elementary, and middle-level education at WilmU. Coursework in the early childhood bachelor’s degree explores child development, exceptional child psychology, and learning differences and assessment. WilmU offers a highly regarded education program for local teachers in Delaware. More than 50% of public elementary school teachers and over 90% of K–12 school leaders in the state call WilmU their alma mater. Students with prior education or experience may transfer up to 90 credits toward a bachelor’s degree, provided the issuing school holds accreditation. WilmU’s BS in ECE features an interdisciplinary curriculum, preparing graduates for careers as principals, administrators, and childcare center directors. Online courses in the bachelor’s in education studies degree begin every eight weeks. Distance learners complete all coursework in the Blackboard platform. WilmU offers online students a per-credit tuition rate for all undergraduate programs. The cost of an undergraduate directed study/internship course varies by location. Military service members receive additional discounts for online learning, and some courses offer discounted pricing. WilmU is regionally accredited by the Middle States Commission on Higher Education (MSCHE). The BS in education studies is fully accredited by the Council for the Accreditation of Educator Preparation (CAEP). Established as a teachers' college in 1929, EOU serves Oregon’s rural counties from its main campus in La Grande. The university sits between Portland, Oregon and Boise, Idaho. EOU students can choose from dozens of on-campus and online programs across seven academic schools, including degrees in the arts, humanities and social sciences, STEM and health science, business, agriculture, nursing, and education. EOU offers an early childhood education degree online through its College of Education. The program prepares graduates to become educators, administrators, and advocates in the private sector for children from birth to age eight. The program does not lead to licensure, but students aspiring to become licensed teachers may pursue a master’s teaching degree at EOU. Full-time students can complete the early childhood education program in two years of study. The bachelor’s degree in early childhood education at EOU requires completion of at least 180 credit hours. The curriculum encompasses a combination of core and upper division major coursework, culminating in a two-part practicum requirement. Applicants must complete prerequisites in early childhood foundations and child development. Course topics explore play and learning environments, literature for young children, and technology in early childhood. Students complete EOU courses online through the Canvas platform. Distance learners enjoy a low set rate for tuition for online undergraduate coursework, charged per credit according to a full-time (12-credit) course load per term. Students with eligible transfer or prior learning credits may qualify for an accelerated online program. Distance learners can access a variety of resources through the online center, including digital tutoring options, a virtual writing center, and test proctoring. EOU is regionally accredited by the Northwest Commission on Colleges and Universities (NWCCU). Founded in 1971 in San Diego, NU maintains its headquarters in La Jolla, California, along with 20 additional campuses throughout California and Nevada. A leader in online education for more than 20 years, NU features over 100 academic programs enrolling on-campus and distance learners from 65 countries and all 50 states. NU is a military-friendly Yellow Ribbon school and offers discounts to service members and their dependants. NU students can complete the early childhood education degree online through the Sanford College of Education. Though the bachelor of arts in early childhood education (ECE) can lead to licensure for California residents, aspiring teachers looking to obtain licensure outside of California should consult their state’s reciprocity requirements. Students must complete field experience as part of the ECE curriculum, ideally in an inclusive general education setting such as an Early Head Start or Head Start program, or a site accredited by the National Association for the Education of Young Children. The bachelor’s degree in ECE comprises 180 quarter units, combining prerequisites, major requirements, and upper-division elective courses. Students must complete an academic seminar or field experience after meeting all other core requirements with at least a C grade. The online ECE bachelor’s degree curriculum explores early language and literacy, children with special needs, and designing emergent curricula for young learners. Students can complete the BA in ECE entirely online, as is true for more than 90 online programs at NU. Distance learners complete courses in Blackboard, using interactive tools such as streaming lectures, chat boards, and virtual presentations. While individual courses may involve synchronous or asynchronous learning, students can communicate with instructors and peers directly through live discussion threads. NU is regionally accredited by the Western Association of Schools and Colleges (WASC). The BA in early childhood education is fully accredited by the National Council on the Accreditation of Teacher Education (NCATE). Founded in 1885 in the Methodist tradition, Southwestern built its reputation on offering high-quality academic and professional programs in Winfield, Kansas and the surrounding areas. The college features dozens of bachelor’s, master’s, and doctoral degrees and certificates on-campus and online. U.S. News & World Report recently ranked Southwestern among the best in the nation for online bachelor’s programs. Southwestern’s early childhood education degree online prepares aspiring teachers for licensure in the state of Kansas. The comprehensive bachelor’s curriculum combines early childhood education (ECE) and early childhood special education, training educators to lead children from birth to age eight in classroom settings. Students must complete at least 124 credit hours, including a student-teaching seminar and supervised teaching capstone course, to earn the degree. Each course in the online bachelor of arts in early childhood education lasts six weeks. Coursework in the online ECE bachelor’s degree explores developmental psychology, infant development, and teaching young children with disabilities. Southwestern operates its own early learning center for children age 2–5 and after-school program for children up to age 13, ideal for ECE students looking to fulfill practicum requirements. The college also maintains partnerships with special education initiatives including the preschool and language stimulation program, the REACH program, and local child care centers in Winfield and the surrounding areas. Southwestern students complete courses online through Blackboard. The college offers eight enrollment sessions per year, allowing distance learners to choose a start date that best suits their schedule. Southwestern assigns academic advisers to all incoming online learners. Applicants to online programs may transfer up to 94 credits for prior learning and/or experience. Distance learners enjoy a set per-credit tuition rate for online learning, with additional discounts available to military students and their families. Southwestern is regionally accredited by the Higher Learning Commission (HLC). The BA in early childhood education is fully accredited by the Council for the Accreditation of Educator Preparation (CAEP). An early childhood education degree prepares graduates to teach children from infancy until they are about eight years old—typically through the third grade. Some programs have both a non-licensure and a licensure track, and some even prepare students for initial licensure tests for working with grades K-3. Other specializations include birth through kindergarten, age three to grade three, preschool, infant/toddler, parent and family education, child learning and development, and administration. A typical online school for early childhood education takes four years to complete and typically include field experience. Some programs serve as a bachelor’s degree completion program, requiring prospective students to have an associate degree or equivalent experience to enroll. An early childhood education program typically covers models of growth, assessment methods, classroom management techniques, learning through play, language development, literacy skills, interpersonal communications, and strategies for cultivating family and community relationships. Students learn to meet the developmental needs of children from diverse backgrounds and understand the role adults play in their lives. Students also learn to create curricula and teach math, science, language arts, social studies, health, and the arts. While graduates with associate and bachelor’s degrees can both work in early childhood education, earning a bachelor’s degree has extra benefits. Graduates with a bachelor’s degree can work as lead preschool teachers, preschool directors, and elementary teachers for K–3 students. Meanwhile, associate degree graduates only qualify for lower-level education jobs like assistant preschool teacher. Earning a master’s in early childhood education means even more opportunities. With a master’s degree, you can work in advanced fields like curriculum development or principalship, or you can become a college professor who teaches early childhood education. For most early childhood education careers, a bachelor’s degree will suffice; however, if you’re undecided about whether or not to pursue a higher degree, consider potential early childhood education salaries. With a degree in early childhood education, you can work in the public or private education sectors, or you can start your own business working as a tutor. You should choose your career path based on your personality and interests. For example, if you’re an extrovert, you might enjoy working as a co-teacher. If you love motivating others and organizing tasks, a preschool director is probably more your speed. Below are a few example professions for early childhood education degree holders. As an early childhood educator, you work on the front lines, helping children learn and grow. These professionals work with children who are 3–6 years old in preschool and daycare settings, where they make sure each child’s physical and educational needs are met. Preschool directors oversee the daily operations of preschool facilities. They hire employees, assess lesson plans, communicate with parents, and handle student enrollment. Directors must be flexible and calm under pressure, as no two days are ever the same. Kindergarten teachers work with children ages 5–6 in an elementary school setting. These teachers help students ease into elementary school. They also deliver lesson plans for basic subjects like reading, writing, and rudimentary math. Nannies usually work for private families, providing in-home care, supervision, and education for children. Au pairs often work in foreign countries and teach children English, while nannies typically work in their native country. Some nannies specialize in caring for children with special needs. Tutors work one-on-one with students to help them with specific school subjects. Some tutors work for companies while others choose self-employment. Tutors can work both online and in-person, and often set their own hours. When exploring your options for earning an online degree in early childhood education, take your time. The first school you find might not be the right choice for you. We live in an age where you have many online programs to choose from, so don’t feel afraid to set the bar high and be selective. Note that in-state universities generally cost less than out-of-state universities. For example, if you live in Texas you can save money by enrolling in a Texas-based school. The first thing to look at when researching colleges is price. Private universities often cost more than state universities, but that doesn’t mean the education is necessarily better. However, you should be wary of programs that are significantly cheaper than most, as they might not be accredited. Online school rankings can help you evaluate cost and quality. Always check a school’s transfer policies. While you might feel set on a certain school or program, you might change your mind later, so it’s good to keep your options open. Most regionally accredited schools have transferable credits, but some credits only transfer as electives and not as degree credits. Before enrolling in an early childhood education degree online, ask yourself whether you would prefer a public or private college. This helps to narrow down your choices. If you prefer more one-on-one attention from your professors, a private institution is the way to go. If you don’t mind larger class sizes, you can save money by attending a state school. If you want to focus most of your attention on completing your degree quickly, enroll in a full-time or accelerated program. If you have a busy schedule and prefer a slower pace, enroll in a part-time program. Typically, full-time students complete bachelor’s degrees in four years, while part-time students take 6–8 years. If you want to study completely from the comfort of your home, or if you live in a different part of the country from your university, pay close attention to on-campus requirements. While most programs don’t have them, some courses require supervised tests or in-person adviser meetings, so double-check your program requirements. When it comes to choosing a master’s in early childhood education online program, accreditation should be a top priority. Schools can earn regional accreditation, national accreditation, or programmatic accreditation. Regional accreditation means the schools accrediting agency is approved by the Council for Higher Education Accreditation (CHEA). National accreditation agencies, on the other hand, operate nationwide and usually focus on vocational schools. Programmatic accreditation focuses on particular subjects and usually serves as a secondary accreditation. Generally, regionally accredited school are more prestigious than nationally accredited ones, and as such their credits transfer more easily between institutions. While the U.S. Department of Education and CHEA don’t grant accreditation, they do oversee accreditation agencies to ensure integrity. To learn more, check out CHEA’s list of accrediting bodies for private, state, and community colleges. For programs in early childhood education, you should also research programmatic accreditation, which is handled by the National Council for Accreditation of Teacher Education and the Teacher Education Accreditation Council. How Long Does It Take to Get a Degree in Early Childhood Education? It typically takes full-time students 5–5 years and part-time students 6–8 years to complete an early childhood education bachelor’s degree online. If you prefer to complete your degree faster, look for an accelerated program that allows students to double up on credits. Most students with full-time jobs prefer to enroll as part-time students, but it is possible to work part time while also going to school full time. Since tuition costs keep rising, completing your degree in a timely manner can save money. Most accredited schools require about 120 credits for graduation. That means if you want to graduate in four years, you need to take at least 15 credits per semester. To understand toddlers, it is helpful to understand developmental stages. In this class, students learn the normal stages of development over the first few months of a child’s life. This course also covers recognizing and intervening in developmental problems that begin during infancy. As an early childhood education professional, you must meet each child’s physical needs. In this class, students learn health, safety, and nutrition basics, including what children should eat, how to prevent dangerous accidents, and how to foster a healthy learning environment. When adults meet a child’s physical needs the child is able to focus on learning and developing. From ages 3–6, children grow and change a lot. In this course, students learn the stages of child development and how family units affect the process. Through this course, students learn normal characteristics for each early childhood stage, which allows them to identify children who are developmentally behind. No two family units have exactly the same dynamics, and learning about the differences can help educators understand how to best communicate with and motivate young children. Unfortunately, some children come from broken homes, and teachers must be sensitive to a child’s home life. Even online early childhood education programs require practical classroom experience. In this class, students work in a classroom setting under a lead teacher’s supervision. Students apply their studies to practical situations and practice creating and implementing lesson plans. This national network of more than 700 childcare resource and referral centers helps childcare providers stay up-to-date on the latest research and data. It also advocates for policies that benefit children, families, and childcare providers. DEC offers exclusive professional development opportunities, conferences, job boards, and webinars. It focuses on providing educators with resources to help them best serve children with special needs. NAEYC hosts annual conferences, trainings, and webinars. It also provides helpful resources, including a list of the most helpful childhood education books, articles about industry topics, and a blog written by fellow educators. As an educator, you must be able to serve diverse students. NBCDI hosts annual conferences and provides members with culturally-relevant and research-based curricula focusing on the needs of black students. Members also receive access to exclusive social media networking groups. This organization hosts educational conferences and virtual events that educate childcare providers on infants' complex needs. It also provides members with a scholarly journal featuring articles about early education topics like promoting healthy eating habits and helping students form routines.